Are you looking for a beautiful single or double loft bed or high bed, or a bunk bed? 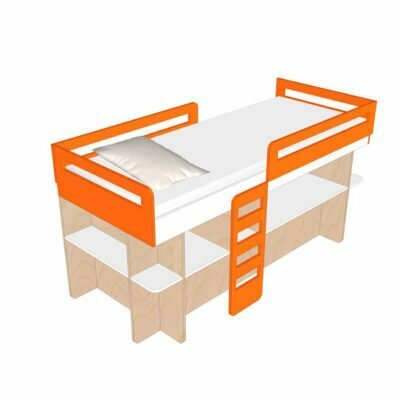 Here you can find drawings / plans / designs for special beds that you can just make yourself. There are DIY designs for two-person high beds, half-height beds and single loft beds for 80 and 90 cm wide mattresses. Prices are generally € 14.95 for a PDF download. 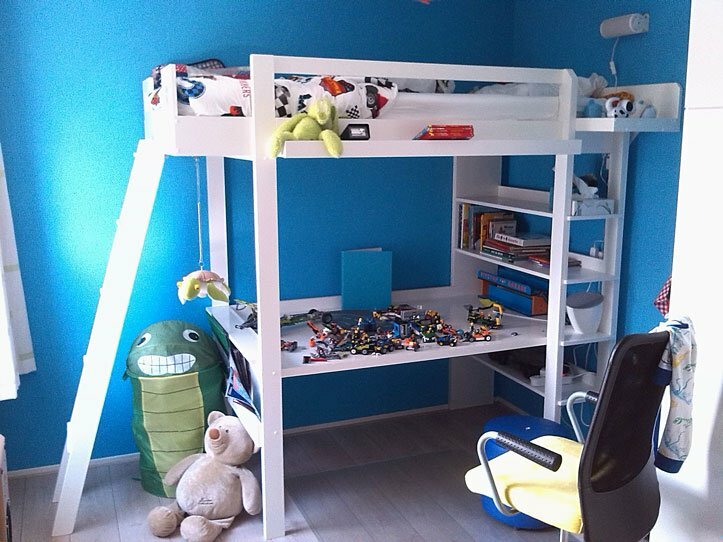 You’ll receive an original design with detailed drawings and full instructions. With help from our design plan, you can easily make this beautiful high bed yourself. 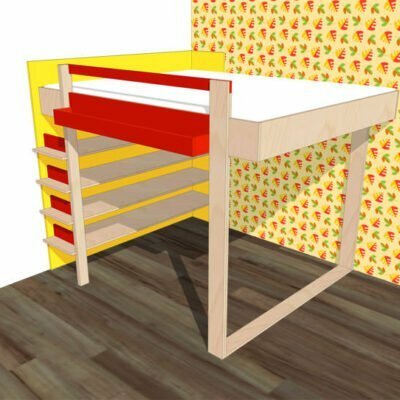 Loft bed Wolf: a sleek, smart high bed with integrated desk and ample storage space. This double version of our beloved loft bed Ana looks daring, but it really works! 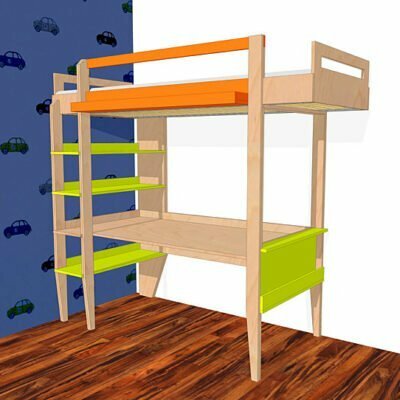 Make this designer bunk bed yourself, with cleverly integrated bookshelf. 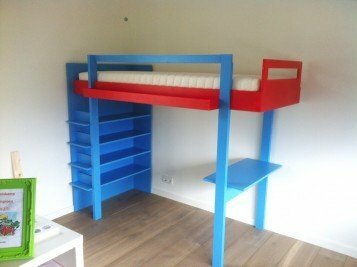 Special bunk bed that looks light-hearted because the uprights are not placed at the corners. Half-height loft bed Demi: fresh loft bed with ample storage space. Light and airy design. 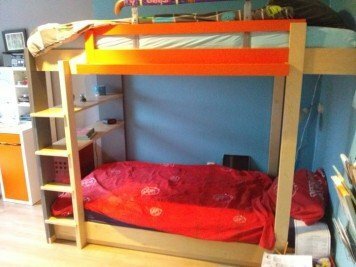 Lots of people have already used our instructions with design drawings to make their own beautiful loft beds. 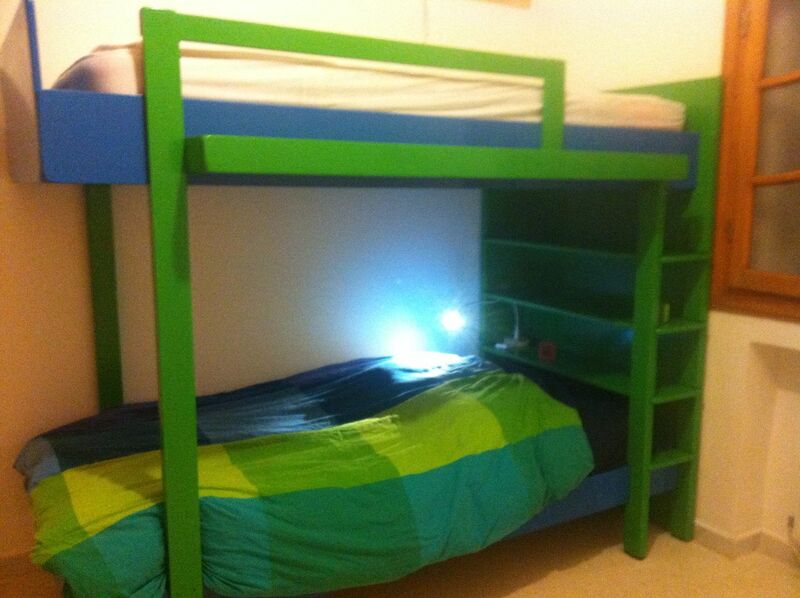 Take a look at the photos of finished furniture that they have sent us. 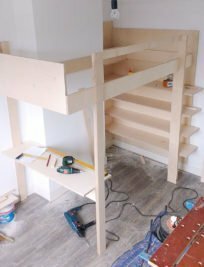 Also on the product pages of the various models you can read reviews from them about their experiences with building their own loft bed, high bed, bunk bed or half-height bed. 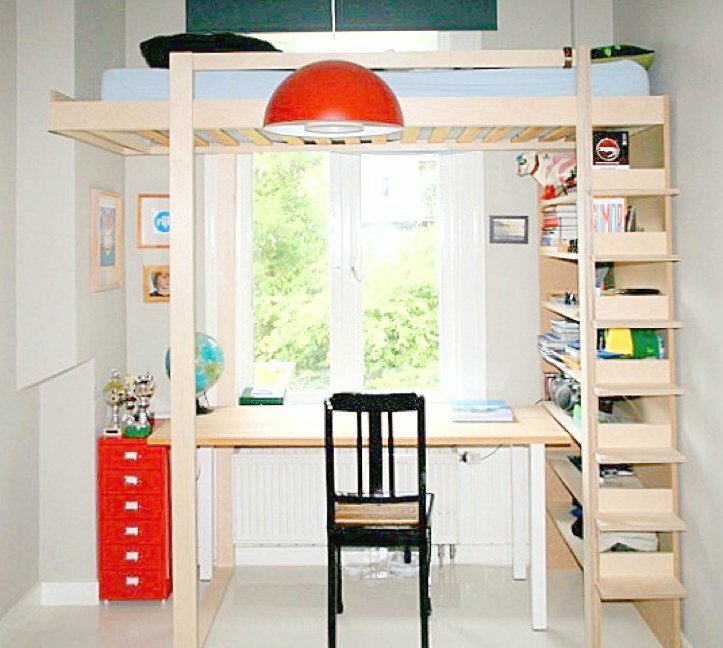 Neo-Eko manuals with design plans for loft beds and bunk beds offer the possibility to easily change the design to suit your own wishes. 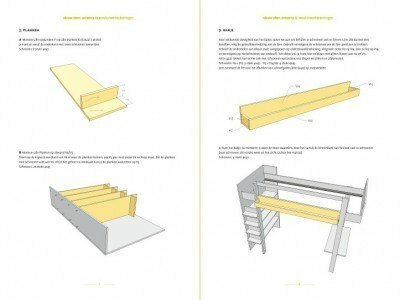 Because the underlying design is good, the practical methods and drawings invite you to make changes. 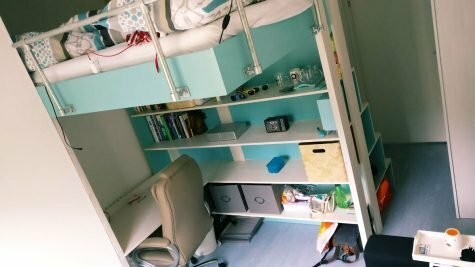 In the photos and stories from our customers you can get an idea of what is possible. 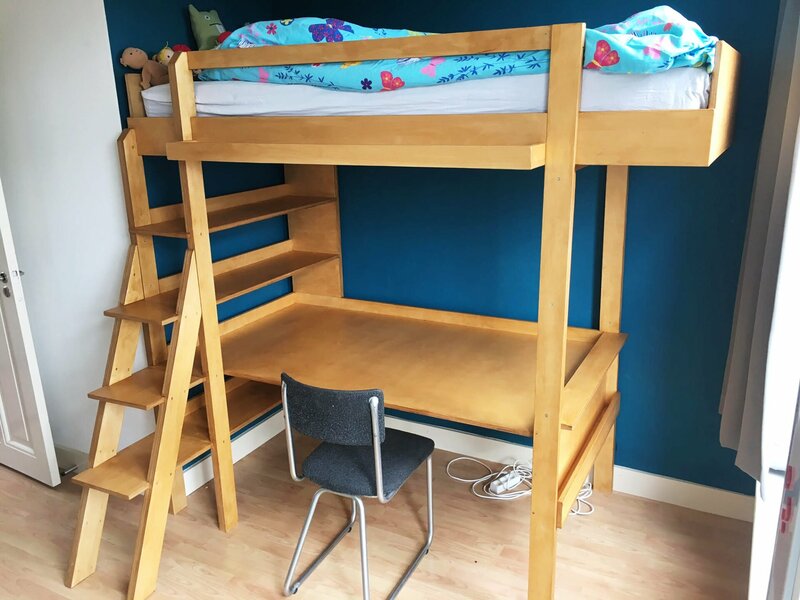 Not just changes to the dimensions, but also changes to the layout and addition of new elements such as ladders, stairs, desks and bookshelves. Be inspired by the photos of finished furniture that they have sent us. 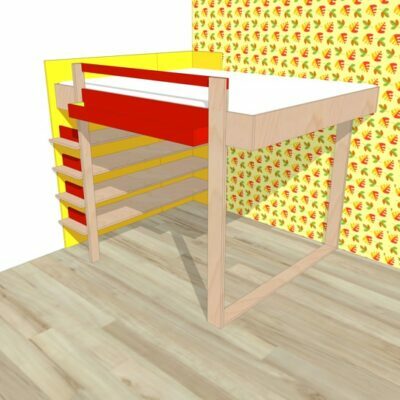 With our design plans you have everything under your control, including the choice of material and finish. 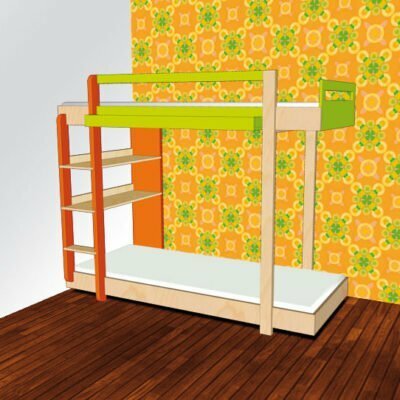 Bunk Mila: make yourself this special bunk bed. 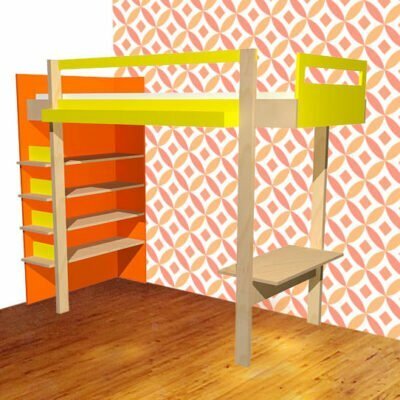 Make yourself this design bunk with smart integrated bookcase. 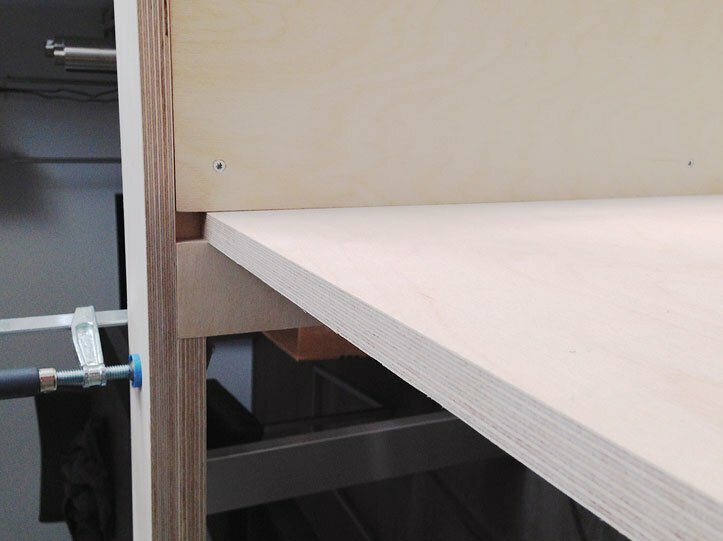 The entire device is made of sheet material; the uprights are also made of this. Some parts may also be made of MDF. 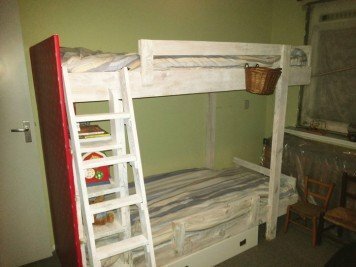 Excluding slats. Double loft bed Ana: loads of room! 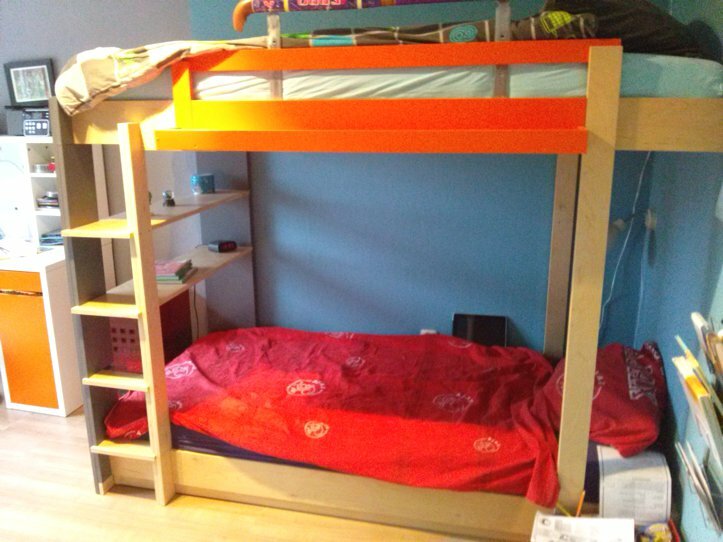 This two person variant of our beloved loft bed Ana looks bold and daring… but you really can make it yourself! The condition is that it needs to be fixed to a wall along the long side – then it will be as solid as a rock. 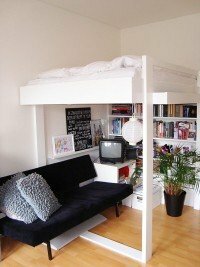 Because the uprights of this loft bed are set back from the corners, the design has a pleasant lightness to it. 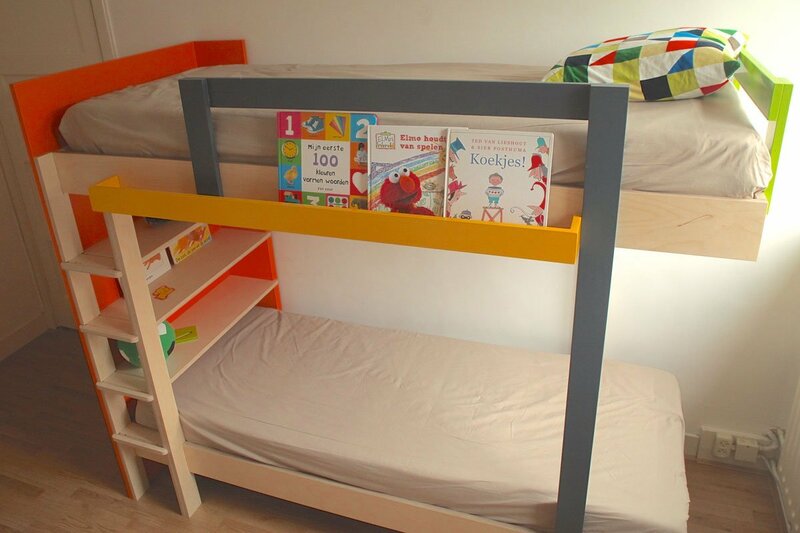 You can easily make this high bed yourself, with help from our manual and its clear drawings. 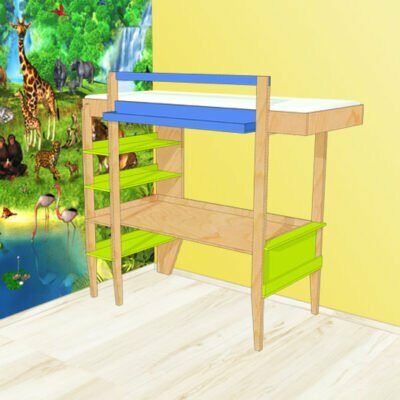 It is entirely made from wooden sheet material, such as plywood, MDF or old scaffold boards. 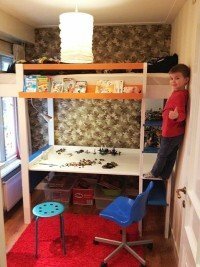 It has lots of storage space on the shelves and a handy little table. 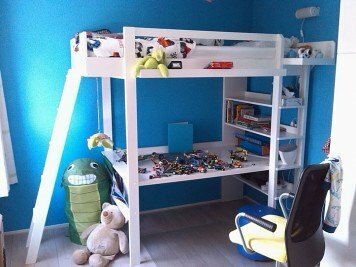 The design has a pleasant lightness to it because the uprights are not at the corners. Includes cutting list and cutting diagram. 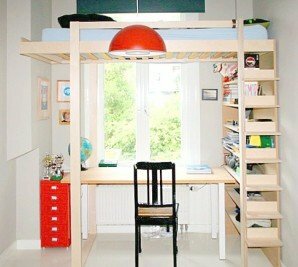 Loft bed Wolf: a sleek, smart loft bed with desk and storage space on the (book) shelves. This high bed is completely made of sheet material, for example from birch plywood. 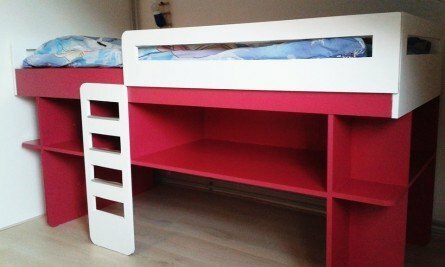 Some parts can also be made of MDF.